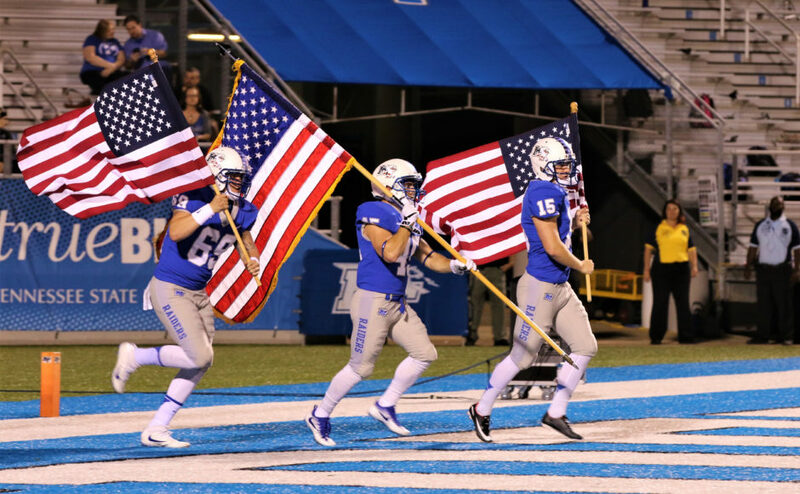 The Middle Tennessee State Blue Raiders (4-5, 2-3) defeated the University of Texas-El Paso Miners (0-9, 0-5) by a score of 30-3 on Salute to Armed Forces night at Floyd Stadium. 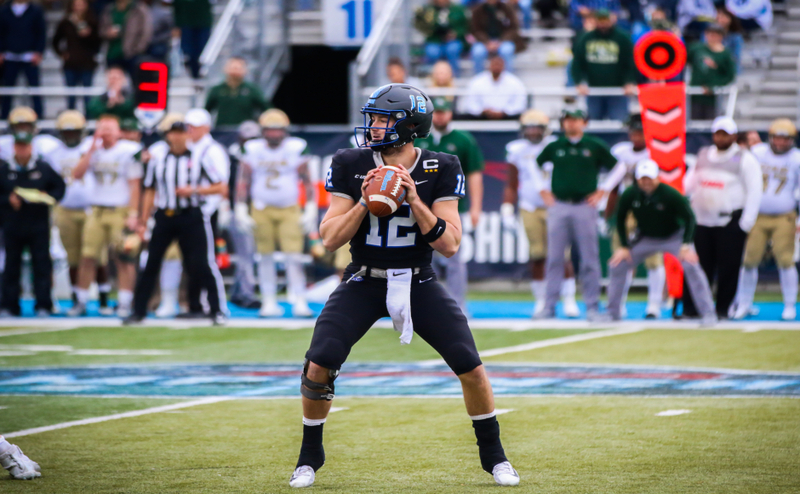 Middle Tennessee welcomed prolific quarterback Brent Stockstill back to the lineup for the first time since he was injured in a week two tilt with Syracuse. Lou Groza semi-finalist Cannon Rooker got the scoring started midway through the first quarter when he connected on a career-long 51-yard field goal to give MTSU a 3-0 advantage. With 16 seconds left in the first quarter, Stockstill found Ty Lee for a 25-yard touchdown pass to bring the score to 10-0 in favor of the Blue Raiders. Just before the break, Shane Tucker snatched the ball away from a UTEP defender on a fourth-down reception to keep a Blue Raider drive alive. 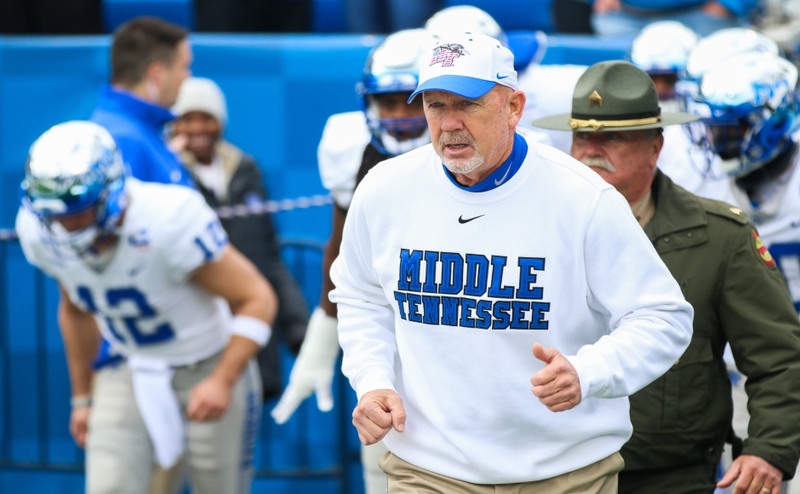 Then, Stockstill found freshman Jimmy Marshall on a five-yard touchdown pass to give Middle Tennessee a 17-0 lead, a score they’d take into the locker room. For Marshall, it was his first career touchdown reception. In the second half, the defense helped the Blue Raiders cruise to victory. The Blue Raiders tacked on 13 more points in the half via a two-yard touchdown run for Tavares Thomas and a two-yard touchdown reception by Tavonn Salter. However, the Middle Tennessee defense stole the show in arguably their best performance of the season. MTSU ended the game with three sacks, seven quarterback hurries, six tackles for loss and only three points allowed all night. The Middle Tennessee defense stood strong against the lackluster UTEP offense, giving up an average of just 2.85 yards per play. In the first half, UTEP mustered just 20 yards on the ground and had 36 yards through the air in seven drives. Middle Tennessee allowed just three first downs in the half. 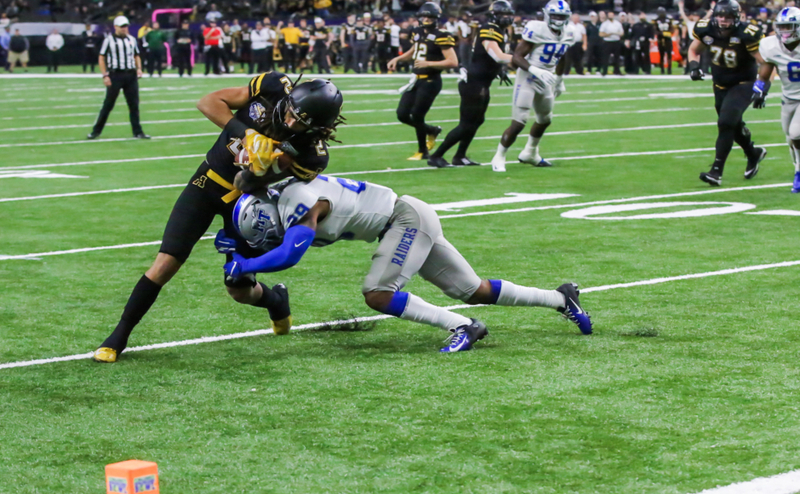 At the beginning of the game’s second frame, the Miners got the ball to start their fifth drive in Middle Tennessee territory at the 40-yard line. Freshman linebacker DQ Thomas came up with his first career sack, driving UTEP back 15 yards and ultimately helping the Blue Raiders force a punt. On the ensuing Miner drive, Khalil Brooks picked up sack number 6.5 on the year to force another UTEP punt after the Miners started their drive at midfield. In the beginning of the second half, MTSU surrendered a field goal to UTEP and responded by playing an extremely physical final 20 minutes of the ballgame. The Blue Raider defense only allowed three more first downs for the remainder of the game. MTSU allowed a season-low 137 total yards as a defense. The MTSU special teams group stepped up and did their part in a game where the team dominated in all three phases. In the first quarter, Rooker’s 51-yard field goal made him become the first kicker in school history to hit two kicks of 50-plus yards in one season after setting a previous career-long of 50 yards against Marshall last week. Punter Matt Bonadies averaged 42.2 yards per punt and had two punts that landed inside the UTEP 20-yard line. Bonadies punted from his own end zone twice and got the ball out of field goal range for UTEP both times. In the return game, Reed Blankenship returned 5 punts and averaged 11.2 yards per return. The physicality even translated into the special teams phase of the game, when defensive end Tyshun Render delivered a hit that measured on the Richter scale during a punt return. 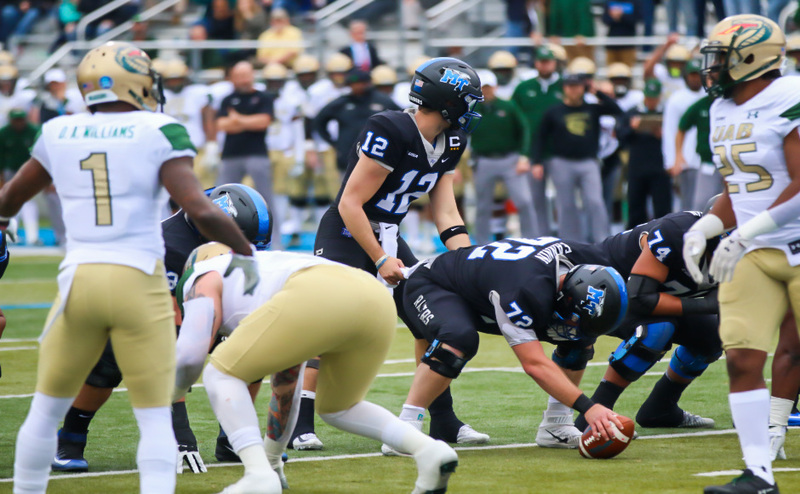 His hit in the third quarter helped continue the tone the Blue Raiders set into the final minutes of the game. Blue Raider quarterback Brent Stockstill made his highly anticipated return to the gridiron after missing the past six games due to a cracked sternum. This comes on the heels of Stockstill’s backup, John Urzua, having to retire from football due to concussions. Stockstill threw for 190 yards on 13 completions and three touchdowns through the air, good for a 122.9 passer rating. The Murfreesboro native hooked up with Ty Lee six times in the game, including his first quarter touchdown pass when he found Lee on a seam route to make it a two-possession ballgame. Stockstill completed two of his touchdown passes to a pair of freshman, Jimmy Marshall and Tavonn Salter. Those receptions were the first touchdowns of both Marshall and Salter’s young careers. MTSU will head to Charlotte, North Carolina next Saturday for a 1:00 matchup with the University of North Carolina-Charlotte 49ers (1-8, 1-4).